Following weeks of festive holiday excess many readers will sympathize with Ms. Willis’s seasonal unrest. New York Diaries 1609 to 2009, edited by Teresa Carpenter, blows the dust from the pages of over 100 diaries to create a multifaceted portrait of New York and its inhabitants. What follows is so much more than a rigorous survey. In terms of research alone, New York Diaries is an enviable feat. The physical effort that Ms. Carpenter has poured into this anthology is palpable with the turn of each page. We sense the hours, days and months that she has spent in New York’s deepest archival vaults, rooting through long forgotten storage boxes or white gloved, gingerly handling the most delicate handwritten texts. Moreover, Ms. Carpenter does not limit her research to the diaries of published writers. Luminaries such as Mark Twain, Charles Dickens and Walt Whitman take up their rightful place in the anthology, yet their learned observations are set alongside the diary entries of “obscure columnists,” “clergymen” and “precocious Victorian adolescents.” Ms. Carpenter’s selection shapes New York Diaries into an insightful and delightfully eccentric study of everyday life in the metropolis. Given the breadth of the study, the diverse range of diary entry styles (from the letter diary of an unidentified Hessian mercenary to internet blogspeak) and the varying stylistic approaches to English over four centuries, it is clear from the outset that Ms. Carpenter is most adept at handling this wealth of complex information. New York Diaries is arranged chronologically, beginning on January 1st and ending on December 31st. The format encourages the reader to dip into the anthology to read entries penned on the calendar date on which he or she is reading. Particularly if the reader is in New York, this practice serves to forge an unnerving bond across the ages. With regards to the aforementioned Winifred Willis, we understand her post-festive slump, today, as we too look out at graying winter skies. For those readers who choose to read New York Diaries from first page to last, there is a distinct sense of the change of seasons. We witness the autumn leaves fall in New York across the centuries and share the biting cold endured by the colonial printer Hugh Gain on December 27, 1797, and again by the diarist and auction house owner Phillip Hone on the same day in 1833. In terms of shared pain, however, there can be none greater than those diary entries beginning on and following September 11, 2001. Ms. Carpenter captures the shock, disbelief, heartbreak, and anger expressed by New York bloggers. In many respects, New York Diaries pivots around this one date, and in doing so tells the story of a living city which is vulnerable, yet strong: a metropolis that can be shaken to its very foundations, yet maintain momentum. Ms. Carpenter’s study exposes the fissures and cracks of catastrophe ever present in New York’s bedrock: disease, poverty, riots, fires and financial crashes. Yet, she also reveals a city that is always ready to rejoice in that unstoppable energy which pulses through its streets and avenues. 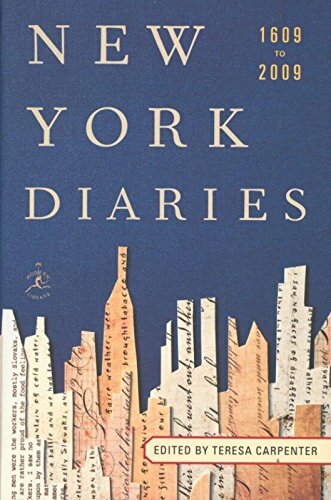 As an idea, New York Diaries is so beautiful in its simplicity that many readers will wonder why it has not been conceived of earlier. There are few contemporary books that truly capture the essence of New York City. In terms of photography, New York: Portrait of a City by Reuel Golden draws together 600 iconic images of the metropolis from across the ages and is a remarkable tribute to the city’s grit and glamour. In terms of architecture, the AIA Guide to New York City is a veritable bible, detailing the metropolis’s key buildings street by street. Yet if we are to understand the New York that lies beyond the celluloid and stonework, we must now reach for Teresa Carpenter’s New York Diaries. Hers is the story of what animates the city: New Yorkers themselves. As hilarious as it is heartbreaking, New York Diaries is a must read for anyone who has fallen in love with the Big Apple. It is, in essence, a celebration of the complexity, beauty and chaos of New York City by means of capturing the voices of those who have repeatedly trodden its sidewalks. It will prove to be one of the most essential books when discussing the history of the living, breathing metropolis.